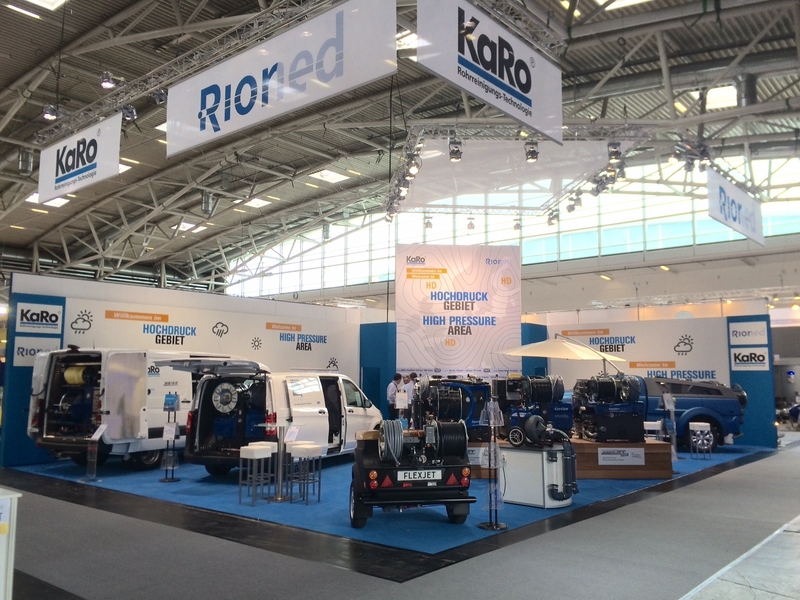 As European market leader, Rioned has been manufacturing and distributing high pressure jetting and vacuum units for over 60 years and has reputation for building innovative equipment that is reliable, safe and durable. At the show Rioned will launch a newly designed lightweight van-pack jetter, which is suitable for use in compact vans. The standard package includes a hydraulically driven high-pressure hose reel with MaxFlow lightweight jetting hose and filling reel. The 5-channel radio remote control allows single user operation to control the pump, engine revs and emergency stop, while all models feature the award winning eCONTROL+ user interface. Also on display at the exhibition will be Rioned’s range of jet/vac combination units, including the FlexCom 7.5t combination jet-vac unit, which features enhancements for 2018. The FlexCom range was launched in 2015 to be lighter, more manoeuvrable and more efficient than larger combi units. Since then it has become a popular choice for drainage contractors and utility companies with over 40 models in operation across the UK. With a focus on simplicity of use, the FlexCom 7.5t was designed as a single-resolution unit that can be operated remotely by a single person. The powerful unit features a high-performance vacuum pump and can be supplied with several high-pressure pump configurations. The suction hose connects to a 3,000 or 3,500 litre partitioned tank for immediate operation. The hydraulically operated hose reel pivots 180° and includes 100 metres of high-pressure hose. While broadly similar to the 7.5t model, the larger FlexCom 10 tonne and 12 tonne versions features a tank capacity of 3750 litres, with a hydraulic internal moveable tank partition as standard. The units can be fitted with vacuum pumps for different operations, including palette blade pump (325 m³/hour), air injected pump (430 m³/hour), liquid ring pump (516 m³/hour) and blower suction pump (1.500 m³/hour). All units are fitted with RioMote 9 channel radio remote control. Alongside its van-pack, combination and trailer units the IFAT stand will feature a range of drum and portable machines, including Rioned’s spring machines and Spartan Tool’s equivalent cable units developed for the North American market.